The London Symphony, 111-year old bastion of UK musical institutions famed for its virtuosity and flexibility, is an orchestra in transition. The peripatetic Valery Gergiev remains its official Principal Conductor through the end of this year, but the LSO created a big splash earlier this month when it announced that Simon Rattle will become its Music Director in 2017 (note the elevated title given to Sir Simon). 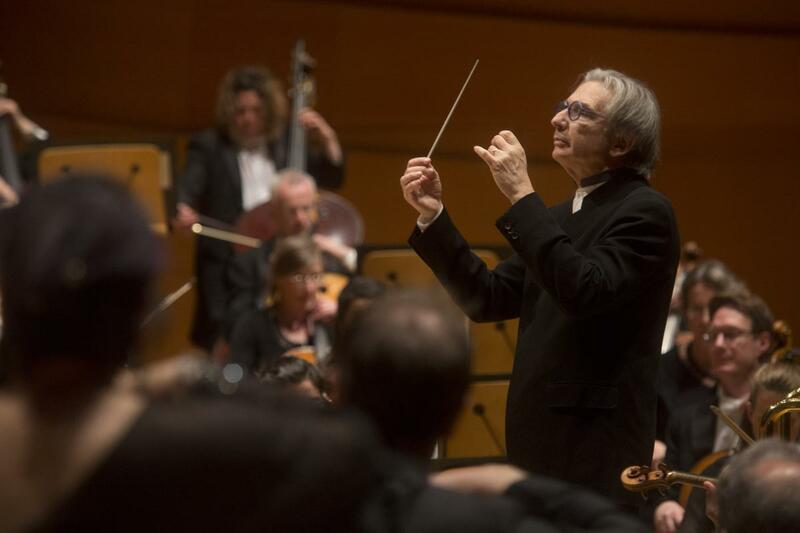 Two weeks after the big announcement, the LSO departed for a multi-city trek through the Western US, with Michael Tilson Thomas — not Mr. Rattle nor Mr. Gergiev — on the podium. Given all that was happening, it seemed a fortuitous choice. The Los Angeles native and Music Director of the San Francisco Symphony has previously conducted one orchestra or another at most of the venues on the tour, particularly the SFS’s home of Davies Symphony Hall, and Walt Disney Concert Hall, where just two months ago he led the Los Angeles Philharmonic in Beethoven’s Missa Solemnis. MTT is also no stranger to the Londoners: he is one of the LSO’s two Principal Guest Conductors and previously served as its Principal Conductor from 1988-1995. The music they brought along (Britten, Gershwin, and Sibelius alternating with Shostakovich) seemed to give them a chance to show the breadth of their range while simultaneously being smack dab in middle of their collective wheelhouse. 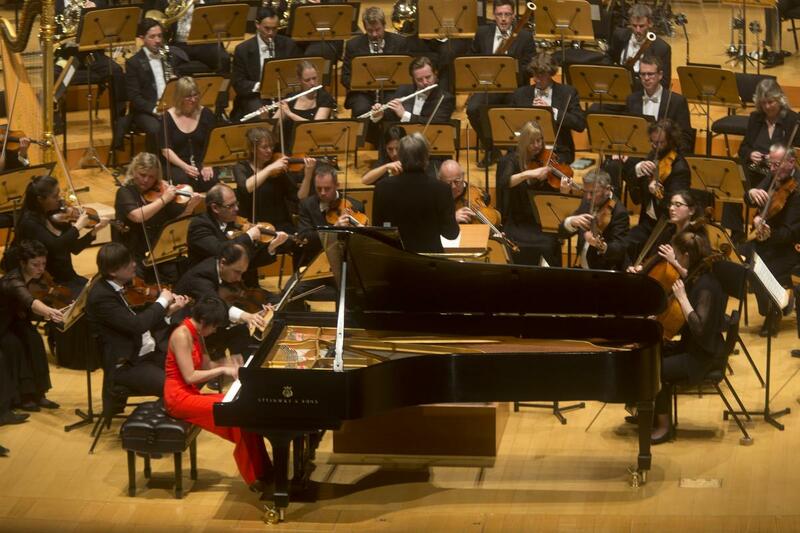 They even brought the magnetic Yuja Wang along as their guest soloist. All the ingredients seemed to be in place for an amazing set of concerts. So, going into their performance last Tuesday night at Disney Hall, my expectations were admittedly high. Coming out of it, I was conflicted. Overall, it was an enjoyable night of music; however, despite being excellent on many fronts, it failed to gel completely. It left me appreciative of the effort but with the nagging feeling that more could have — and should have — been possible. Things started out well enough. The many moods and textures of Britten’s Four Sea Interludes from Peter Grimes allowed the LSO a chance to strut its stuff immediately. The orchestra collectively displayed a rich variety of timbres and responded to Mr. Tilson Thomas’s straightforward direction with a thrilling combination of energy and sensitivity. For his part, the conductor kept everything nicely balanced: more serene moments in the first and third interlude were allowed to breathe without losing momentum, while the tumult in the fourth interlude was aggressive without being bombastic. 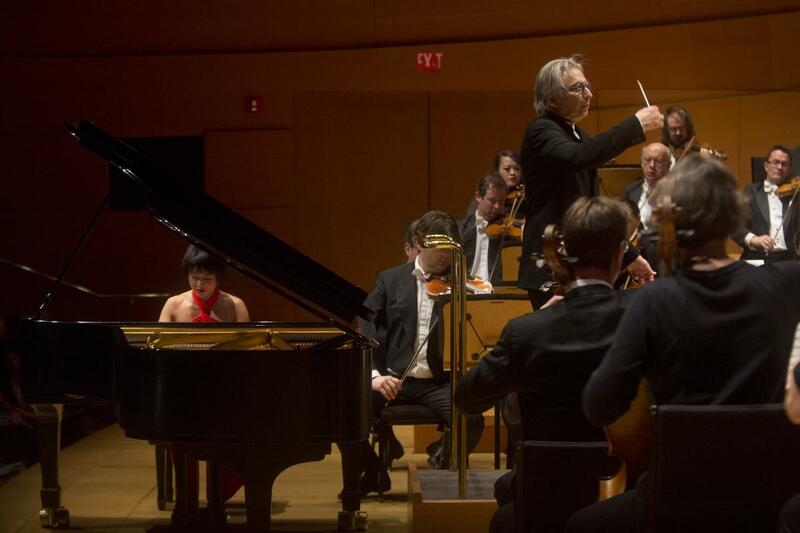 Orchestra and conductor were equally up to the task in Gershwin’s Piano Concerto in F. MTT has been playing or conducting this piece since he was a prodigy at USC, and his familiarity with it was on full display. Rhythms swayed with just the right amount of sass. Lines ebbed and flowed perfectly, never being too syrupy on one hand or too rigid on the other. Unfortunately, Ms. Wang proved to be an ill-suited partner. Her interpretation was too cold and analytical: jazzy passages and lyrical ones both sounded uniformly robotic, without a hint of playfulness, soul, or potentially even anguish that more compelling performances of the concerto can display. An exceptionally saucy rendition of the famous second movement trumpet solo by Philip Cobb, the LSO’s Principal Trumpet, further highlighted how painfully mechanical Ms. Wang’s playing sounded. Even more surprising was her timidity in choice of dynamics: though Ms. Wang is not the most powerful of pianists, I’ve never strained to hear her during past performances of other concertos at WDCH; on this night, however, her sound was often buried underneath that of the LSO, especially in the first movement and sometimes when the orchestra was playing at a comfortable mezzo-forte . Ms. Wang’s renowned technical skills were best brought to bear during the the final movement, whose clockwork-like punctuations and speedy octave runs were best suited to her temperament. I found it to be a satisfactory ending to what was otherwise a disappointing performance. That said, Gershwin’s music is rather bulletproof, and at a minimum, I was extremely happy to have it performed at all. Most of the very large audience seemed to like it even more than me, giving the pianist an immediate and long-lasting standing ovation. In response, she played a composition by Mr. Tilson Thomas, “You Come Here Often?” Her performance of the rollicking solo piano work was her most persuasive playing of the night. Sibelius’s 2nd Symphony rounded out the evening. It has been a signature work for the orchestra, particularly during the tenure of Colin Davis as Principal Conductor. With MTT at the helm on this occasion, the results were beautiful, often inspiring, yet ultimately frustrating. Mr. Tilson Thomas took a restrained, almost reticent approach throughout. He focused on details of texture and often waited until the last moment before letting climaxes bloom. It worked well with the lilting phrases in the first movement and dark sonorities of the second movement, underlining the sense of melancholy and foreboding in both. It was less successful in the third movement, especially with MTT smoothing out the contrast in tempos between the vivacissimo and lento sections. When the fourth movement arrived, Mr. Tilson Thomas continued to hold back, stifling the full effect of the opening fanfare. As the movement progressed, the conductor slowed things down even more, taking frighteningly slow tempos during the long buildup to the finale, killing all the momentum in the process. The ensuing finale, normally triumphant and cathartic, was instead underwhelming, like taking an elevator ride to the second-highest floor of the Empire State Building. For their part, the LSO ranged between solid and spectacular the entire evening. They could often sound like a million bucks; the strings were particularly impressive with a bright yet sumptuous tone matched with pristine ensemble playing. However, that level of playing was unfortunately not sustained the whole evening. On more than one occasion, entrances were bumpy and blend was uneven. The trumpets, playing larger B-flat trumpets instead of the C trumpets typically used in American orchestras, had a round, burnished tone; the horns, by comparison, often sounded blunt and plain. Perhaps the LSO was having difficulty adjusting to WDCH. Indeed, some visiting orchestras have struggled in the exposed, crystalline acoustics here, and Mr. Rattle called the LSO’s home base at London’s Barbican Centre merely “serviceable.” Frankly, the Londoner’s good-to-great sound on this night reminded me of how the LA Phil sounded immediately after moving into Disney Hall: not quite comfortable, pushing their sound more than they needed. That theory was reinforced by the orchestra’s performance in their encore, Brahms’ Hungarian Dance No. 1. They looked the completely relaxed in the process, playing with swagger and sounding the most confident and close-knit as they did the entire evening. The audience loved it, responding with a flood of enthusiastic applause, stopping only when MTT made the final “let’s go to sleep” gesture as he walked off the stage. 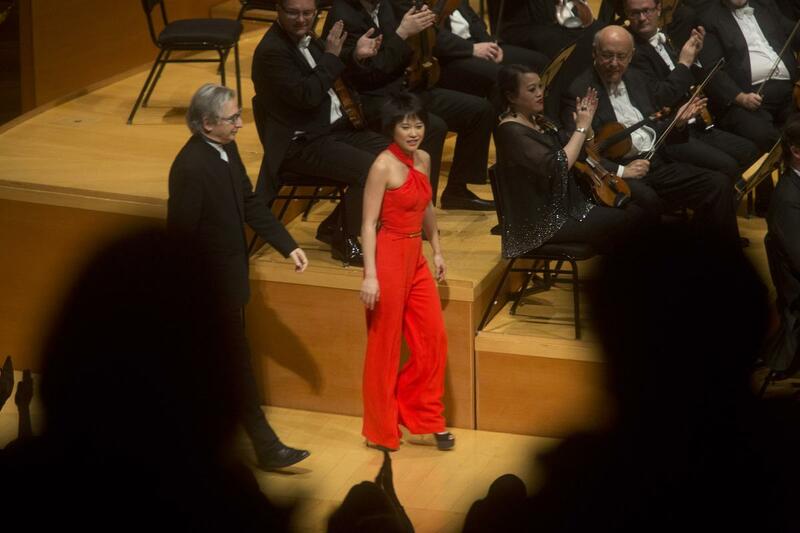 The most amusing moment occurred after Ms. Wang’s encore: after taking a few of her trademark bows — deep bends from the waist, her head coming close to her knees, done at whip-crack speed — she asked Mr. Tilson Thomas to take a bow as the work’s composer. He stepped up and tried to imitate her bow, snapping quickly down and up, only to grab his back in faux (?) pain as a result. For the fashionistas out there: Ms. Wang’s wardrobe on this evening consisted of a sleeveless, saffron-colored jumpsuit and 4-inch tall platform stiletto heels. For a different point of view, read Rick Shultz’s review in the Orange County Register HERE. Tags: Britten, Gershwin, Michael Tilson Thomas, Philip Cobb, Sibelius, Yuja Wang. Bookmark the permalink. I loved Wang’s deft use of her iPad while playing the encore.